As I reported on the new offshore wind strategy by the United States yesterday, Scotland was busy welcoming the beginning phase of the world’s first, and largest underwater tidal energy farm which will be placed off the north coast of Scotland. The first out of the four planned turbines sits at a height of 49 ft, 53 ft in diameter and over 40,000 lbs with a capacity of 1.5 megawatts (MW). 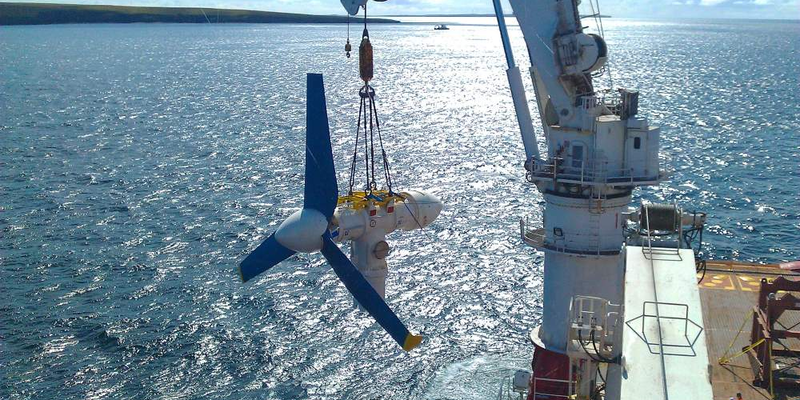 The MeyGen tidal stream project, is headed by Edinburgh-based developer, Atlantis Resources (AR) along with the U.S. investment bank, Morgan Stanley, and a French-owned energy firm, International Power. So far, according to The Guardian, AR has received about £23 million ($30 million) from the Scottish government and will seek to gain additional capital in order to meet its goal of eventually having a total of 269 turbines that would increase the capacity to 398 MW. If this point is reached, it would be enough electricity for around 175,000 homes. Her main point being that because the technology is still in its very early phases, it will take massive support and backing from the industry in order to make tidal energy financially feasible. So while we do not know the exact figures on how much each underwater turbine costs, we can assume that the price is fairly high at the moment. But besides the hefty cash outlay, one primary advantage that tidal energy has over wind is that it is more predictable than wind currents are, so we could see a more predictable, and potentially shorter, payback period once tidal power hits its stride in the future. You can read more into the current technology that MeyGen is utilizing here. No word on when the other three turbines will be constructed and placed, but once finished, the total capacity, at least for this phase (1A), should be close to 6 MW. Additionally, once MeyGen fully builds out their lease to its full 398 MW capacity, it will run for 25 years and then be decommissioned.